For the 2005 film adaptation, see Charlie and the Chocolate Factory (film). For the book, see Charlie and the Chocolate Factory. Willy Wonka & the Chocolate Factory is a 1971 American musical fantasy family film directed by Mel Stuart, and starring Gene Wilder as Willy Wonka. It is an adaptation of the 1964 novel Charlie and the Chocolate Factory by Roald Dahl. Dahl was credited with writing the film's screenplay; however, David Seltzer, who went uncredited in the film, was brought in to re-work the screenplay against Dahl's wishes, making major changes to the ending and adding musical numbers. These changes and other decisions made by the director led Dahl to disown the film. The film tells the story of an only child Charlie Bucket (Peter Ostrum), who receives a Golden Ticket and visits Willy Wonka's chocolate factory with four other children from around the world. Filming took place in Munich in 1970, and the film was released by Paramount Pictures on June 30, 1971. With a budget of just $3 million, the film received generally positive reviews and earned $4 million by the end of its original run. The film became highly popular in part through repeated television airings and home entertainment sales. In 1972, the film received an Academy Award nomination for Best Original Score, and Wilder was nominated for a Golden Globe as Best Actor in a Musical or Comedy, but both nominations lost to Fiddler on the Roof. The film also introduced the song "The Candy Man", which went on to become a popular hit when recorded by Sammy Davis Jr. In 2014, the film was selected for preservation in the United States National Film Registry by the Library of Congress as being "culturally, historically, or aesthetically significant". In a small town, Charlie Bucket, a poor paperboy, watches a group of kids visit a candy shop. Walking home, he passes Willy Wonka's chocolate factory. A mysterious tinker recites the first lines of William Allingham's poem "The Fairies", and tells Charlie that nobody ever goes in, and nobody ever comes out. Charlie rushes home to his widowed mom and bedridden grandparents. After telling Grandpa Joe about the tinker, he reveals that Wonka locked the factory because other candy makers, including rival Arthur Slugworth, sent in spies to steal his recipes. Wonka disappeared, but after three years resumed selling candy; the origin of Wonka's labor force is unknown. The next day, Wonka announces that he has hidden five "Golden Tickets" in chocolate Wonka Bars. Finders of the tickets will receive a factory tour and a lifetime supply of chocolate. The first four tickets are found by the gluttonous Augustus Gloop, from Germany, the spoiled Veruca Salt, from England, the gum-chewing Violet Beauregarde, from Montana, and the television-obsessed Mike Teevee, from Arizona. As each winner is announced on TV, a man whispers to them. Charlie opens two Wonka Bars — one that was given to him for his birthday, and the other that Grandpa Joe bought with his tobacco money — but doesn't find a Golden Ticket in either. A news report announces the fifth ticket was found by a millionaire/casino-owner in Paraguay causing Charlie to lose hope. The next day, Charlie finds some money in a gutter in the street and uses it to buy a Scrumdiddlyumptious bar. With the change, he buys another Wonka Bar for Grandpa Joe; while walking home, Charlie hears people reading the newspapers, revealing that the Paraguayan millionaire created a fake ticket, and the last real golden ticket still remains. Charlie opens the Wonka Bar and finds the fifth golden ticket, quickly catching the attention of everyone around him, before his paper route boss rescues and sends him home. While rushing home, he encounters the same man seen whispering to the other winners, who introduces himself as Slugworth and offers a reward for a sample of Wonka's latest creation, the Everlasting Gobstopper. Returning home with the Golden Ticket, Charlie chooses Grandpa Joe, who, in his excitement, manages to rise out of bed for the first time in 20 years, as his chaperone. The next day, Wonka greets the ticket winners and leads them inside where each signs a contract before the tour. The factory includes a candy land with a river of chocolate, edible mushrooms, gummy bears, candy canes, chocolate and more sweets. As the visitors sample these, they see Wonka's workers, small men known as Oompa-Loompas. Augustus falls into the chocolate river and is sucked up in a pipe to the Fudge Room. Afterwards, Wonka takes the remaining guests on a surreal boat ride (where Wonka sings and cites the Monorhyme with many words that rhyme with "owing"), eventually leading to the Inventing Room, where everyone receives an Everlasting Gobstopper. Violet becomes a large blueberry after chewing an experimental gum containing a three-course meal, over Wonka's warnings, and must be squeezed before she explodes. The remaining group samples some lickable wallpaper, and then reaches the Fizzy Lifting Drinks Room, where Charlie and Grandpa Joe ignore Wonka's warning and sample the drinks. They float and have a near-fatal encounter with an exhaust fan before burping back to the ground. In the Golden Eggs Room, Veruca demands a golden goose for herself before falling into a garbage chute which leads to the furnace, with her father falling in trying to rescue her. After a messy cart ride, the rest of the group tests out Wonka's Wonkavision, used to teleport chocolate bars and Mike also teleports himself, becoming only a few inches tall. As the tour ends, Charlie, the only visitor left, asks about the fate of the other four kids, and Wonka assures him that that they will be restored to normal, and retreats to his office, without awarding them the promised lifetime supply of chocolate. Grandpa Joe and Charlie enter his office to ask about this, and Wonka furiously informs them that by stealing the Fizzy Lifting Drinks, they violated the contract Charlie signed, thereby forfeiting their prize, and he dismisses them. Infuriated, Grandpa Joe suggests to Charlie that he should give Slugworth the Gobstopper in revenge, but Charlie can't bring himself to do it, and returns the candy to Wonka. With this selfless act, Wonka declares Charlie as the winner; he reveals that "Slugworth" is actually his employee Mr. Wilkinson, and the offer to buy the Gobstopper was a morality test that only Charlie passed. The trio enter the "Wonkavator", a multi-directional glass elevator that flies out of the factory. Soaring over the city, Wonka reveals that his actual prize is the factory; Wonka created the contest to find an heir worthy enough, and so Charlie and his family can immediately move in. The idea for adapting the book into a film came about when director Mel Stuart's ten-year-old daughter read the book and asked her father to make a film out of it, with "Uncle Dave" (producer David L. Wolper) producing it. Stuart showed the book to Wolper, who happened to be in the midst of talks with the Quaker Oats Company regarding a vehicle to introduce a new candy bar from its Chicago-based Breaker Confections subsidiary (since renamed the Willy Wonka Candy Company and sold to Nestlé). Wolper persuaded the company, which had no previous experience in the film industry, to buy the rights to the book and finance the picture for the purpose of promoting a new Quaker Oats Wonka Bar. David L. Wolper and Roald Dahl agreed that the film would be a children's musical, and that Dahl himself would write the screenplay. However, Wolper changed the title to Willy Wonka and the Chocolate Factory. Screenwriter David Seltzer conceived a gimmick exclusively for the film that had Wonka quoting numerous literary sources, such as Arthur O'Shaughnessy's Ode, Oscar Wilde's The Importance of Being Earnest, Samuel Taylor Coleridge's The Rime of the Ancient Mariner and William Shakespeare's The Merchant of Venice. Seltzer also worked Slugworth (only mentioned as a rival candy maker in the book) into the plot as an actual character (only to be revealed to be Wilkinson, one of Wonka's agents, at the end of the film). All six members of Monty Python: Graham Chapman, John Cleese, Eric Idle, Terry Gilliam, Terry Jones and Michael Palin, expressed interest in playing Wonka, but at the time they were deemed not big enough names for an international audience. Three of the members, Cleese, Idle and Palin, were later seriously considered for the same role in Tim Burton's version. Before Wilder was officially cast for the role, producers considered Fred Astaire, Joel Grey, Ron Moody and Jon Pertwee. Spike Milligan was Roald Dahl's original choice to play Willy Wonka. Peter Sellers even begged Dahl for the role. When I make my first entrance, I'd like to come out of the door carrying a cane and then walk toward the crowd with a limp. After the crowd sees Willy Wonka is a cripple, they all whisper to themselves and then become deathly quiet. As I walk toward them, my cane sinks into one of the cobblestones I'm walking on and stands straight up, by itself; but I keep on walking, until I realize that I no longer have my cane. I start to fall forward, and just before I hit the ground, I do a beautiful forward somersault and bounce back up, to great applause. The reason why Wilder wanted this in the film was that "from that time on, no one will know if I'm lying or telling the truth". Jean Stapleton turned down the role of Mrs. Teevee. Jim Backus was considered for the role of Sam Beauregarde. Sammy Davis Jr. wanted to play Bill, the candy store owner, but Stuart did not like the idea because he felt that the presence of a big star in the candy store scene would break the reality. Nevertheless, Davis' recording of the film's opening musical number, "The Candy Man", would top the Billboard record charts in 1972, despite the fact that Davis initially hated the song. Anthony Newley also wanted to play Bill, but Stuart also objected to this for the same reason. Principal photography commenced on August 31, 1970, and ended on November 19, 1970. The primary shooting location was Munich, Bavaria, West Germany, because it was significantly cheaper than filming in the United States and the setting was conducive to Wonka's factory; Stuart also liked the ambiguity and unfamiliarity of the location. External shots of the factory were filmed at the gasworks of Stadtwerke München (Emmy-Noether-Straße 10); the entrance and side buildings still exist. The exterior of Charlie Bucket's house, a set constructed solely for the film, was filmed at Quellenstraße in Munich. Charlie's school was filmed at Katholisches Pfarramt St. Sylvester, Biedersteiner Straße 1 in Munich. Bill's Candy Shop was filmed at Lilienstraße, Munich. The closing sequence, in which the Wonkavator is flying above the factory, is footage of Nördlingen in Bavaria. Production designer Harper Goff centered the factory on the massive Chocolate Room. According to Paris Themmen, who played Mike Teevee, "The river was made of water with food coloring. At one point, they poured some cocoa powder into it to try to thicken it but it didn't really work. When asked [what the river was made of], Michael Böllner, who played Augustus Gloop, answers, 'It vas dirty, stinking vater.'" In addition to the main scenes set in town and at the factory, several comic interludes were also shot. Uncredited screenwriter Robert Kaufman wrote several short humorous scenes related to the Wonka Bar hysteria. Stuart lamented in his book Pure Imagination: The Making of Willy Wonka and the Chocolate Factory, that his favorite scene was cut due to poor test screenings. In the scene, which took a lot of preparation and money to film, an English explorer climbs a holy mountain to ask a guru the meaning of life. The guru requests a Wonka Bar. Finding no golden ticket, he says, "Life is a disappointment." Stuart loved the scene, but few laughed. He invited a psychologist to a preview, where again, the audience reaction was muted. The psychologist told him, "You don't understand, Mel. For a great many people life is a disappointment." Before its release, the film received advance publicity though TV commercials offering a "Willy Wonka candy factory kit" for sending $1.00 and two seals from boxes of Quaker cereals such as King Vitaman, Life and any of the Cap'n Crunch brands. Probably the best film of its sort since The Wizard of Oz. It is everything that family movies usually claim to be, but aren't: Delightful, funny, scary, exciting, and, most of all, a genuine work of imagination. Willy Wonka is such a surely and wonderfully spun fantasy that it works on all kinds of minds, and it is fascinating because, like all classic fantasy, it is fascinated with itself. Charles Champlin of the Los Angeles Times praised the film as "lively and enjoyable" and called Wilder's performance "a real star turn", but thought the songs were "instantly forgettable" and that the factory looked "a lot more literal and industrial and less empathic than it might have". Variety called the film "an okay family musical fantasy" that had "good" performances but lacked any tunes that were "especially rousing or memorable". Howard Thompson of The New York Times panned it as "tedious and stagy with little sparkle and precious little humor". Gene Siskel gave the film two stars out of four, writing, "Anticipation of what Wonka's factory is like is so well developed that its eventual appearance is a terrible letdown. Sure enough there is a chocolate river, but it looks too much like the Chicago River to be appealing. The quality of the color photography is flat. The other items in Wonka's factory — bubblegum trees and lollypop flowers — also look cheap. Nothing in the factory is appealing." Jan Dawson of The Monthly Film Bulletin wrote that after a slow start the second half of the film was "an unqualified delight—one of those rare, genuinely imaginative children's entertainments at which no adult need be embarrassed to be seen". By the mid-1980s, Willy Wonka & the Chocolate Factory had experienced a spike in popularity thanks in large part to repeated television broadcasts and home video sales. Following a 25th anniversary theatrical re-release in 1996, it was released on DVD the next year, allowing it to reach a new generation of viewers. The film was released as a remastered special edition on DVD and VHS in 2001 to commemorate the film's 30th anniversary. In 2003, Entertainment Weekly ranked it 25th in the "Top 50 Cult Movies" of all time. Willy Wonka was ranked No. 74 on Bravo's 100 Scariest Movie Moments for the "scary tunnel" scene. On Rotten Tomatoes, the film has a 91% approval rating and an average rating of 7.8/10 based on 46 reviews. 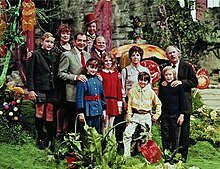 The site's critical consensus states: "Willy Wonka and the Chocolate Factory is strange yet comforting, full of narrative detours that don't always work but express the film's uniqueness." Dahl disowned the film, the script of which was partially rewritten by David Seltzer after Dahl failed to meet deadlines. Dahl said he was "disappointed" because "he thought it placed too much emphasis on Willy Wonka and not enough on Charlie", as well as the casting of Gene Wilder instead of Spike Milligan. Dahl was also "infuriated" by the deviations in the plot Seltzer devised in his draft of the screenplay, including the conversion of Slugworth, a minor character in the book, into a spy (so that the film could have a villain) and the "fizzy lifting drinks" scene along with music other than the original Oompa Loompa compositions (including "Pure Imagination" and "The Candy Man"), and the ending dialogue for the film. In 1996, Dahl's second wife, Felicity, commented on her husband's objections towards the film saying "they always want to change a book's storyline. What makes Hollywood think children want the endings changed for a film, when they accept it in a book?" In 2017, an animated adaptation of the film with Tom and Jerry was released. Tom and Jerry: Willy Wonka and the Chocolate Factory stars JP Karliak as Willy Wonka and is dedicated to Gene Wilder, who died less than a year before the release. The film was first released on DVD in 1997/1999 in a "25th anniversary edition" as a double sided disc containing a widescreen and "standard" version. The "standard" version is an open matte print, where the mattes used to make the image widescreen are removed, revealing more picture at the top and bottom that was masked off from viewers. VHS and Betamax copies were also available, but only containing the "standard" version. A special edition DVD was released, celebrating the film's 30th anniversary, on August 28, 2001, but in full screen only. Due to the lack of a letterboxed release, fan petitioning eventually led Warner Home Video to issue a widescreen version on November 13, 2001. It was also released on VHS, with only one of the special features (a making-of feature). Several original cast members reunited to film documentary footage for this special edition DVD release. The two editions featured restored sound, and better picture quality. In addition to the documentary, the DVD included a trailer, a gallery, and audio commentary by the cast. In 2007, Warner Home Video released the film on HD DVD with all the bonus features from the 2001 DVD. The film was released on Blu-ray on October 20, 2009. It includes all the bonus features from the 2001 DVD and 2007 HD-DVD as well as a 38-page book. In 2011, a new deluxe-40th-anniversary edition Blu-ray/DVD set was released on November 1, consisting of the film on Blu-ray Disc and DVD as well as a bonus features disc. The set also included a variety of rarities such as a Wonka Bar-designed tin, four scented pencils, a scented eraser, a book detailing the making of the film, original production papers and a Golden Ticket to win a trip to Los Angeles. The set is now out of print. The Academy Award-nominated original score and songs were composed by Leslie Bricusse and Anthony Newley, and musical direction was by Walter Scharf. The soundtrack was first released by Paramount Records in 1971. On October 8, 1996, Hip-O Records (in conjunction with MCA Records, which by then owned the Paramount catalog), released the soundtrack on CD as a "25th Anniversary Edition". In 2016, UMe and Geffen Records released a 45th Anniversary Edition LP. 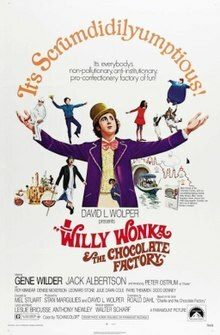 "Main Title" – Instrumental medley of "(I've Got A) Golden Ticket" and "Pure Imagination"
"End Credits" – "Pure Imagination"
"(I've Got A) Golden Ticket"
"I Want it Now/Oompa Loompa"
^ The film's distribution rights were transferred to Warner Bros. in 1977, when that company purchased Wolper Pictures Ltd. and Quaker Oats sold its share of the film. ^ "Willy Wonka and the Chocolate Factory". British Board of Film Classification. August 20, 1971. Archived from the original on May 12, 2016. Retrieved August 9, 2015. ^ "Willy Wonka & the Chocolate Factory (1971)". British Film Institute. Archived from the original on September 27, 2016. Retrieved September 21, 2016. ^ a b "Willy Wonka & the Chocolate Factory (1971) - Financial Information". The-numbers.com. Archived from the original on September 9, 2016. Retrieved February 15, 2017. ^ a b c Falky, Ben (September 12, 2016). "Why Roald Dahl Hated The Willy Wonka And The Chocolate Factory Film". Yahoo! Movies. Archived from the original on September 13, 2018. Retrieved September 30, 2018. ^ "Willy Wonka's Everlasting Film Plot". BBC News. July 11, 2005. Archived from the original on December 5, 2010. Retrieved March 7, 2010. "He thought it placed too much emphasis on Willy Wonka and not enough on Charlie," said Liz Attenborough, trustee of the Roald Dahl Museum and Story Centre in Buckinghamshire. ^ "Willy Wonka and the Chocolate Factory". AFI Catalog of Feature Films. Archived from the original on August 8, 2016. Retrieved August 30, 2016. ^ a b c J.M. Kenny (Writer, Director, Producer) (2001). Pure Imagination: The Story of Willy Wonka and the Chocolate Factory (DVD). USA: Warner Home Video. Archived from the original on December 8, 2006. Retrieved December 2, 2006. ^ a b Paur, Joey. "25 Fun Facts About Willy Wonka and the Chocolate Factory". GeekTyrant. Archived from the original on July 12, 2015. Retrieved September 30, 2018. ^ a b c Honeybone, Nigel (April 25, 2012). "Film Review: Willy Wonka and the Chocolate Factory (1971)". HorrorNews.net. Archived from the original on July 9, 2015. Retrieved July 8, 2015. ^ Segal, David (March 28, 2005). "Gene Wilder: It Hurts to Laugh". The Washington Post. Archived from the original on September 8, 2016. Retrieved July 8, 2015. ^ Evans, Bradford (January 31, 2013). "The Lost Roles of Peter Sellers". Splitsider. Archived from the original on July 14, 2015. Retrieved July 11, 2015. ^ a b Perkins, Will. "Gene Wilder's Willy Wonka Demands Revealed". Yahoo! Entertainment. Archived from the original on September 18, 2015. Retrieved September 18, 2015. ^ "Jean Stapleton Dies: Top 10 Facts You Need to Know". Heavy.com. June 1, 2013. Archived from the original on July 13, 2015. Retrieved July 13, 2015. ^ Chandler, Ed (June 3, 2013). "Five Things You Should Know About Jean Stapleton". KBKL News. Archived from the original on July 13, 2015. Retrieved September 30, 2018. ^ a b "Willy Wonka and the Chocolate Factory (1971): Notes". Turner Classic Movies. Archived from the original on July 13, 2015. Retrieved July 13, 2015. ^ "I am Paris Themmen. I played Mike Teevee in the original Willy Wonka. AMA!". Reddit. September 2, 2014. Archived from the original on October 28, 2014. Retrieved May 4, 2015. ^ Mel Stuart (June 2005). Pure Imagination: The Making of Willy Wonka and the Chocolate Factory. St. Martin's Press. pp. 19–20. ISBN 978-0-312-35240-0. ^ Stuart, Mel; Young, Josh (2005). Pure Imagination: The Making of Willy Wonka and the Chocolate Factory. St. Martin's Press. pp. 85-ff. ISBN 978-0312352400. ^ "Willy Wonka Candy Factory 1971 TV commercial". YouTube. December 19, 2011. Archived from the original on March 10, 2016. Retrieved October 3, 2015. ^ "Willy Wonka & the Chocolate Factory: Box Office Data, DVD and Blu-ray Sales, Movie News, Cast and Crew Information". The-numbers.com. Archived from the original on November 9, 2013. Retrieved May 4, 2015. ^ Ebert, Roger (January 1, 1971). "Willy Wonka and the Chocolate Factory". Chicago Sun-Times. Archived from the original on September 9, 2016. Retrieved September 27, 2017. ^ Champlin, Charles (July 28, 1971). "'Wonka' Fare for Families". Los Angeles Times. Part IV, p. 1, 10. ^ "Willy Wonka And The Chocolate Factory". Variety: 13. May 26, 1971. ^ Thompson, Howard (July 1, 1971). "Chocolate Factory". The New York Times: 61. ^ Siskel, Gene (July 18, 1971). "There's Gold in Willy Wonka Chocolate Bars". Chicago Tribune. Section 5, p. 1. ^ Dawson, Jan (December 1971). "Willy Wonka and the Chocolate Factory". The Monthly Film Bulletin. 38 (455): 253. ^ "Bravo's 'The 100 Scariest Movie Moments'". Archived from the original on August 1, 2007. ^ "Willy Wonka and the Chocolate Factory". Rotten Tomatoes. Retrieved December 6, 2018. ^ Pure Imagination: The Story of 'Willy Wonka and the Chocolate Factory'. Two Dog Productions Inc. 2001. ^ "Willy Wonka & the Chocolate Factory (1971)". Dvdmg.com. Archived from the original on September 23, 2015. Retrieved May 4, 2015. ^ "Willy Wonka & the Chocolate Factory: 30th Anniversary Edition (1971)". Dvdmg.com. Archived from the original on December 24, 2014. Retrieved May 4, 2015. ^ Conrad, Jeremy; White, Cinty (June 6, 2007). "Willy Wonka and the Chocolate Factory (HD DVD)". IGN. Archived from the original on March 27, 2010. Retrieved September 30, 2018. ^ "News: Willy Wonka & The Chocolate Factory". DVDActive.com. Archived from the original on May 6, 2015. Retrieved May 4, 2015. ^ Cook, Tommy (November 1, 2011). "Willy Wonka and the Chocolate Factory 40th Anniversary Box Set Blu-ray Review". Collider. Archived from the original on November 3, 2013. Retrieved May 4, 2015. Wikimedia Commons has media related to Willy Wonka & the Chocolate Factory.